The previous chapters about ammunition and slingshot science taught you what projectiles exist, and how different bands affect your slingshot's performance. But what is the correct ammunition for your slingshot? The lighter your projectile is, the faster it will be, as it needs less force to be accelerated. If our goal was to shoot the fastest projectile possible, we would choose very small, lightweigt ammunition. The heavier your projectile is, the more energy will it carry along, because the rubber works more efficiently if it has more time during acceleration, and because the acceleraton force is distributed between projectile, bands and pouch - so the heavier the projectile is, the bigger is its piece from that cake. If our goal was to shoot the projectile with the highest energy, we would use a very heavy cannonball. Obviously, we neither shoot cannonballs, nor would a tiny plastic BB represent a useful projectile. If it is neither energy nor velocity, what are we searching for? We are searching for a combination of both..and have to include a third factor: The projectile's size. The smaller its diameter, the more force will be exerted on its impact area. A good way to optimize your ammunition is to find the projectile's size that delivers you the highest energy per cross-sectional area of your projectile. I took a random slingshot and shot it over the chrony - using 8, 10, 12 and 14mm steel balls. The results are visible in the above table. The Energy divided by the projectile's frontal cross section reaches a maximum with the 10mm steel ball. Actually, the maximum seems to be somewhere between 8mm and 10mm - one should try out 9mm and 9.5mm ammo as well with this slingshot. The calculation only tells me about the ideal weight of projectile having the same density as the ones used in testing. I have to adjust my ammo size when using projectiles made of a different material, such as glass marbles, lead balls etc. Your choice of ammunition will not necessarily be determined by its ballistic properties. Price per shot plays a role if you don't use a backstop, and you must also consider the biodegradeability in that case. 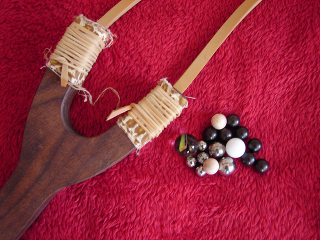 Often, shooters go the other way round - they have a certain ammuniton available, and design their slingshots to suit it. Optimizing your ammunition is anything but a trivial task. The method you just read about is a very simple one, but works surprisingly well, both for finding an accurate projectile that corresponds well with your slingshot, and for finding a powerful ammuntion for hunting purposes.